Pollination by insects is essential for maintaining the riches of nature. Many flowering plants and the animals they nourish could not survive without insects, nor could many human food crops. Much of this pollination can be conducted by honey bees. Thus, although the domestication of bees was motivated by the harvest of their honey and beeswax, bee-keeping has even greater importance. A recent development is its role in urban ecology. Hives on buildings can create honey if there is adequate habitat in which bees can forage, which is a motivation for local habitats that are better for other species and hence start to improve urban food webs. 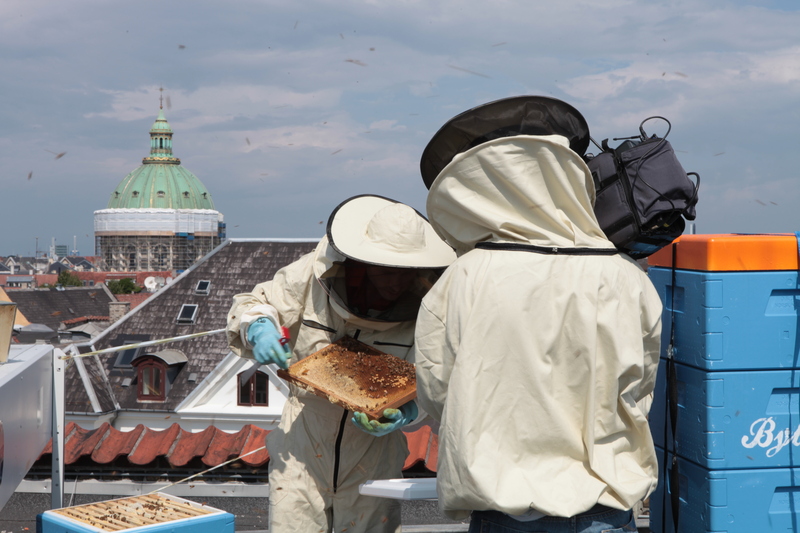 In Copenhagen, following the lead of projects in many cities across Europe, the Copenhagen City Honey Cooperative started a project after the 2009 Climate Conference with the aim of reviving a Danish honey industry and providing employment. At the same time as the launch of the Naturalliance site, the European Environment Agency were joining the Bybi project with those in their neighbouring buildings. Please contact us if you know other examples of bee-keepers preserving or restoring habitat of wider conservation benefit in order to enhance their harvest of bee-products. We would to provide figures such as “by increasing the area of wild-flowers from X to Y ha, the number of hives that could be supported was raised from X1 to Y1”. Read more in Danish about the Copenhagen City Honey Cooperative.